Managing screen-time is high up on the list of responsibilities for raising healthy, happy youngsters and teens. For parents, managing screen-time means keeping a close eye on whether content is age-appropriate and if not, taking steps to keep their children out of harm’s way – possibly amid bouts of complaining and much negotiation. Managing screen-time is a big deal for families, dawn to dusk. With that in mind, let’s scale up to the giant screen of live, national TV sports broadcasts – the highly anticipated fixtures like the Australian Open and the cricket Tests – which see families, young and old, across Australia, glued to the box with the air-con turned up high. Screen-time at this population-level also requires appropriate management. And by appropriate I don’t mean moderating the howling scorn and derision hurled at the umpire by armchair critics, I mean the alcohol advertising that aims to bedazzle sports-loving viewers of all ages, but particularly younger ones. Whether it’s hours of uninterrupted cricket, a gruelling tennis grudge match, or a game of football, children are being bombarded with memorable, influential advertisements. Does ‘summer beer’ and Eugene losing his wallet ring any bells? What immediately fouls this scene of happy first-world living is the ‘sports exemption’ that crept into Australian advertising policy decades ago, which trampled sensible protections against marketing harmful products to kids during their viewing hours. During TV sports coverage alcohol ads are constantly present. Last October, when the national End Alcohol Advertising in Sport campaign was launched, we released a report on the outrageous prevalence of alcohol ads during the football grand finals. It found ads appeared at the rate of just under one per minute for the AFL and more than three per minute for the NRL. These games were mostly played during children’s viewing times. Meanwhile, all Test cricket is played during children’s viewing times. Researchers have proven that exposure to TV alcohol advertising encourages young people to commence drinking earlier and to binge drink more often which increased risks of short- and longer-term harm. And a new Australian-first study released this week, shows that alcohol advertising is positively linked to risky drinking by adolescents. The longitudinal study conducted by Cancer Council of Victoria researchers, shows that risky drinking can be reduced by reducing alcohol advertising on TV. 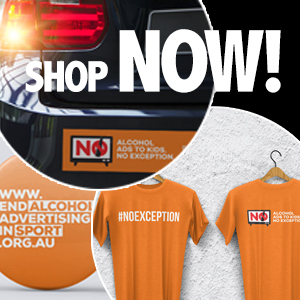 The exemption is adored and abused by alcohol marketers in equal measure, with half of all alcohol advertising being shown during the broadcast of live sporting events – when millions of young Australians are watching. An estimated cumulative audience of 27 million Australian children and adolescents watching Australia’s major televised sporting codes – AFL, Cricket and NRL – are exposed to 51 million instances of alcohol advertising, with nearly half (47 per cent) of these broadcast during daytime programming between 6am and 8.30pm. At a time when the credibility of our major sporting codes is under siege, helping to get rid of the exemption, so that children are not exposed to alcohol advertising during their viewing times, would go a long way towards restoring Australia’s faith in our country’s sporting officialdom. With nine in 10 people condemning the practise of exposing children to alcohol advertising this is an achievable policy correction that would reduce the risk of harm to young Australians. parents should be encouraged to only let them play sports where there is no alcohol advertising or pervasive alcohol cultures. Why do rugby players have publicised alcohol problems but many good neurodevelopment sports have better images.